Paul Hogan, Elias Koteas, Linda Kozlowski, Charlton Heston. 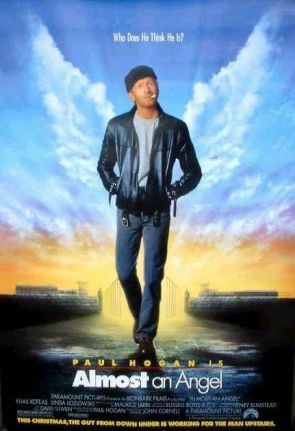 Almost an Angel was Paul Hogan's follow-up to Crocodile Dundee 2. He wrote the screenplay and starred. The film was directed by his friend John Cornell (who produced the first Crocodile Dundee film and directed the second). Almost an Angel did not do very well at the box office. While Hogan's charm is still present - and he can make even the driest and most obvious situation quite humorous - the overall story was somewhat twee with Hogan playing an angel. Stronger films like Ghost were popular at the time. The film continues the tradition of kindly angels from the '30s and '40s with such films as Here Comes Mr Jordan and its remake by Warren Beatty in 1978 as Heaven Can Wait. Linda Kozlowski, Hogan's wife, appears in the film, as does Elias Koteas as her brother. There are some humorous episodes, Hogan disguised as both Willie Nelson and Rod Stewart for bank robberies - and a guest appearance of Charlton Heston as God (perhaps fulfilling a lifelong ambition). 1. The popularity of Paul Hogan - television and skits, impersonations? The impact of Crocodile Dundee? This film as a follow-up? 2. The American settings, the city, the small American town? The atmosphere of the town, homes, charities, churches, the police? The musical score - and songs? 3. The Paul Hogan persona, Australian, genial, the larrikin? Humour? Deadpan? Down and outer, ex-prisoner? Yet always lovable? 4. Paul Hogan as Terry Dean - in prison, a thief, electronics wizard - and his exercising his skills on leaving prison? Farewells? The bank robbery disguised as Willie Nelson and the strength of the impersonation? His attempt to rob the bank as Rod Stewart? 5. The accident, his trying to save the child? In hospital, wondering about what has happened, imagining God appearing to him and offering him the chance to return, being angel of mercy? Thieves shooting at him - with blanks, but Terry seeing this as a sign of his being immortal? 6. His sense of mission, born again, the visit to the church and the discussion with the priest? Leaving behind the money - a miracle? The holding up of the burger bar and its humour? Distributing the food to the down and out in Los Angeles? The removal van, going out to Filmore? 7. The bar, friendly? Meeting Steve, in the wheelchair, defending him, a place to stay? Rose's suspicions? Mrs Garner and her liking Terry? In the house, friendship, attraction to Rose, supporting Steve? His electronic skills - at the recreation centre? The children? 8. Terry and Rose, her support of him? The need to raise money, the Bealemans and their donations - and the threat from the television evangelist, Reverend Barton? 9. Steve, the wheelchair, cantankerous, picking fights? His illness? The short time to live? 10. Terry, the Bealemans' house, the television and the videotape of Reverend Barton - and giving the money to save the children? The humour of the remote control and the illumination of the cross on the church? Bealeman and the giving of the money? 11. The police, asking about Terry, the bar, Steve's reaction? The chase, Steve's injuries, warning Terry - his dying? 12. Terry deciding to leave, Rose trying to illuminate the cross - and no batteries? The oncoming truck - passing through Terry, his hitching a lift - his future as an angel? 13. Audiences enjoying the angel genre of films? The supernatural touches, the miracles? The doing good for people? Terry Dean as the laconic do-gooder - how easily fitting with Paul Hogan's screen image? His explanations of his being an angel and doing good? 14. The strengths of Paul Hogan's comedy - persona, style, timing, laconic wit? How well used in this film?